The new fine and antique jewelry and watch show Lueur took place at the Javitz Center in Manhattan from October 23-25 and I am so glad I got to make a quick trip there to have my eyes as dazzled as they were in July during the New York Antique Jewelry & Watch Show. Both shows are organized by US Antique Shows. Because I was in a time crunch I only had about an hour to take photos and because I had my daughter with me, who is eight and obsessed with cats both big and small, we specifically looked for cat brooches. We weren’t disappointed! Of course I couldn’t help notice a few other things too, like a ballerina clip, some amazing Art Nouveau pieces, and Van Cleef & Arpels from the 1940s. These were my favorites! 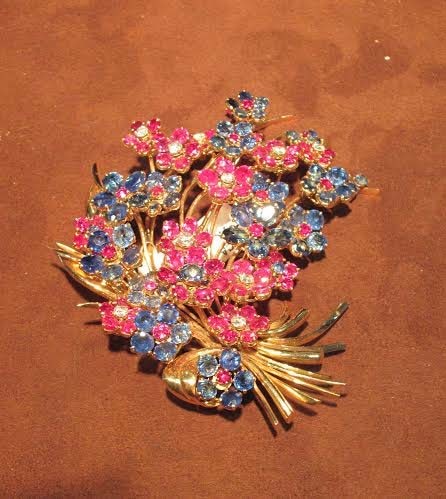 A 1945 “Hawaii” flower clip by Van Cleef & Arpels at Yafa Signed Jewels. One of the first booths we came across when we walked into the show was the Yafa Signed Jewelry booth and it took me about ten seconds to discover this wonderful Van Cleef & Arpels “Hawaii” flower clip from 1945 in the case. I never get tired of seeing anything from the Hawaii collection since I love the mix of the clear blue sapphires with bright pink-toned rubies and the sparkle of tiny diamonds throughout. I don’t think Hawaii pieces are produced anymore so I love seeing them any time I get a chance. A 1970s David Webb panther brooch at Nally Jewels. My daughter found this glorious 1970s David Webb panther brooch at the Nally Jewels booth. Does the girl have great taste or what? Not bad for her first jewelry show, I am training her well! 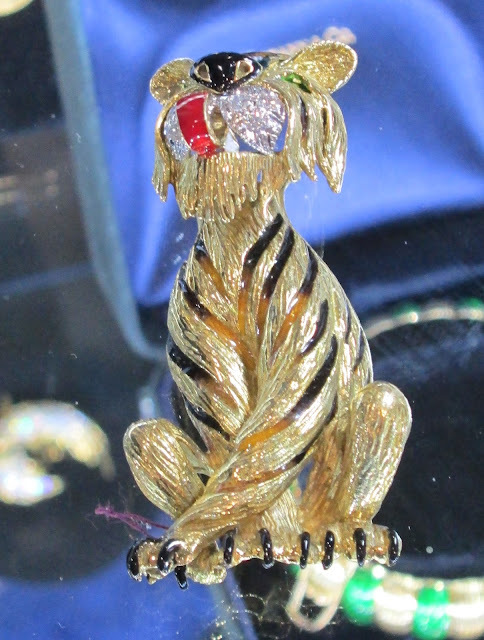 I love the detail of the enameled branch the big cat prowls around on and of course, those emerald eyes and diamond collar! A 1960s David Webb brooch of pearls, rubies, and gold. I am crazy for pearls combined with rubies so while my girl was checking out a case with tiny kitty pins at her eye level, I honed in on this stunner by David Webb from the 1960s. I weep! 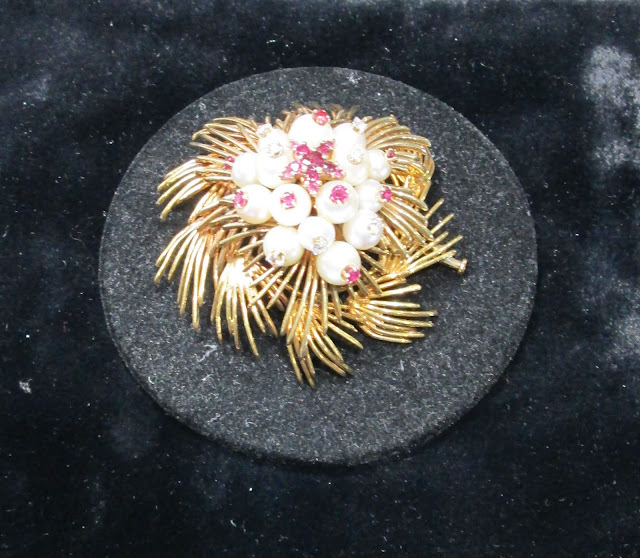 Don’t you love the rubies in the shape of a star in the center of the gold fronds and ruby-tipped pearls? 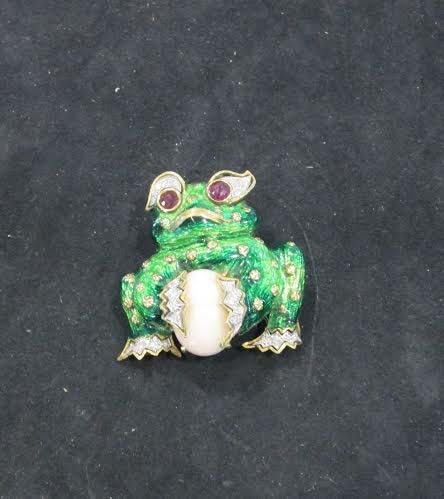 I love the expression on this jaunty frog brooch. My daughter pointed out this frog brooch to me. We both loved the frog’s kooky (ruby and diamond!) eyes and that he is holding a gigantic pearl. I believe this is a copy of a brooch originally designed by Donald Claflin for Tiffany & Co. in 1966, but if you have any firm knowledge one way or another, let me know in the comments! At the same booth my daughter and I agreed that this tiger was a handsome fellow and had to be included in the roundup! 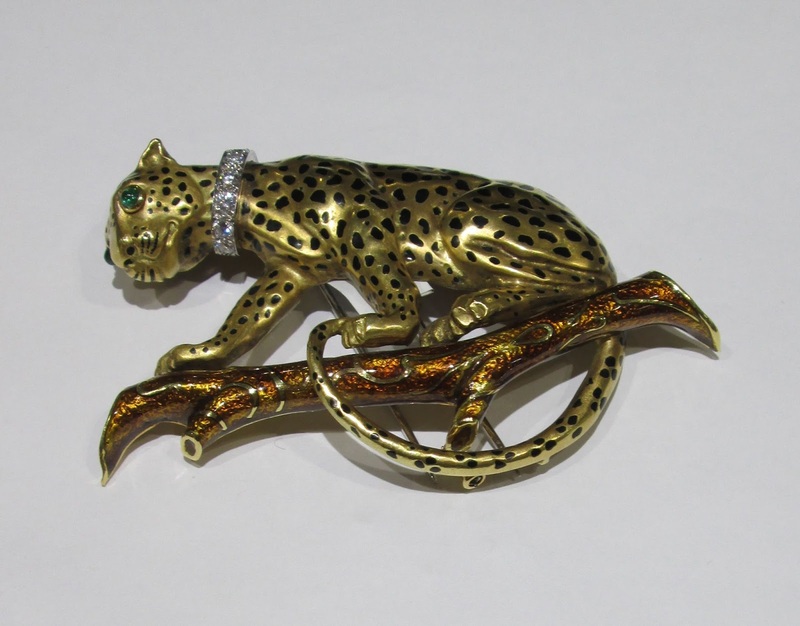 A wonderful Art Nouveau brooch at E.D. Marshall Jewelers. The lovely people at the E.D. Marshall Jewelers booth showed me these ethereal Art Nouveau brooches. I loved them both! I had a tough time getting the camera to focus so forgive the photo quality. I had to share the pictures anyway because I just adored the dreaminess of both pieces. The charming rep named Liz explained to me that the wings are the enameling technique known as plique-à-jour, which gives them their luminosity, while the iridescence of the gown comes from another enameling technique called ronde-bosse, which means encrusted enamel. I loved that each brooch had a delicate pearl or diamond suspended from it at the bottom. Gorgeous! I am especially fond of the fairy below. The tiny bouquet she holds had the smallest strokes of the most brilliant red and blue. What stunning craftsmanship! I wish the picture came out better. I am crazy for this delicate Art Nouveau fairy brooch! 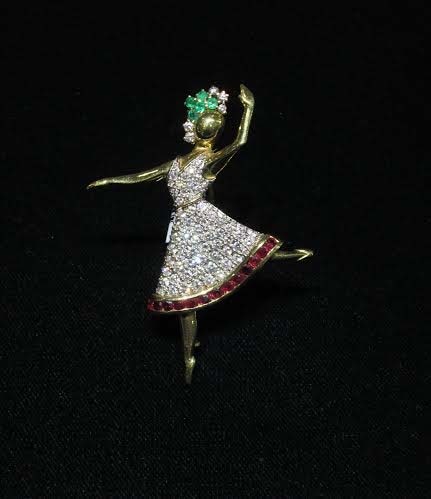 An estate ballerina brooch by J. Roca of Barcelona at Aaron Faber. I don’t know what it is about ballerina clips but they never fail to delight me. I thought this one was so beautiful, just big enough and such sparkle to it! I can imagine that if you wore it you would get compliments on it all the time! I found it at Aaron Faber, a New York-based jeweler, who showed me some great pieces back in July as well. I thought maybe the clip was by Van Cleef & Arpels, but it is by J. Roca in Barcelona, an estate piece, and the nice Aaron Faber rep kindly stood this little lady up en pointe so I could take her photo! I think if I could’ve had just one brooch from the show it would have been either this tiny beauty or the Art Nouveau fairy above in the pale green gown. Wouldn’t either of them be perfect to wear for the upcoming holidays? Let me know which of these brooches is your favorite! The popular Pier Antique Show is right around the corner, on November 14 & 15 in Manhattan at Pier 94, which is located on 55th Street at the West Side Highway. Do go if you have the chance, many of the same exhibitors I highlighted here will also be in attendance! Thank you to the Lueur team and every exhibitor who once again took the time to show me lovely things and teach me something new! I used to love wearing brooches and have not worn it in so long. They are a great way to add interest to an outfit. I somehow missed this "brooch post." I'm a big fan of brooches, especially vintage ones. These are all lovely. It was wonderful to see so many brooches in the fall fashion mags this year. These pieces are awesome. Great photos and picks. Thanks for sharing and for linking up to Top of the World Style. Thank you also for including me in your How I wear my Gray series. I am always looking forward to the series.